Joseph Smith translates using the seer stone placed within his hat while Martin Harris acts as scribe. Image Copyright (c) 2014 Anthony Sweat. Yeah yeah yeah … that’s how it was in our earliest spiritual mortal life. 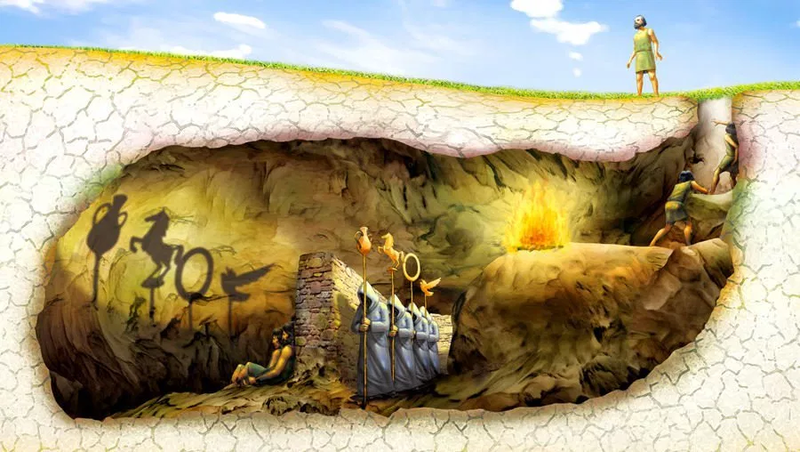 That’s how it was in the earliest years of our culture’s evolution into the 20th and 21st-century society thriving out of the Valley of the Great Salt Lake today. I might suggest one impact of the true-churchiness narrative we were fed like pablum with its claims of exclusivity, a perfect church peopled be imperfect members and the truest doctrines on earth. That impact is that members have a antiseptic perception of the organization, its doctrines, its heroes, its teachings and policies. 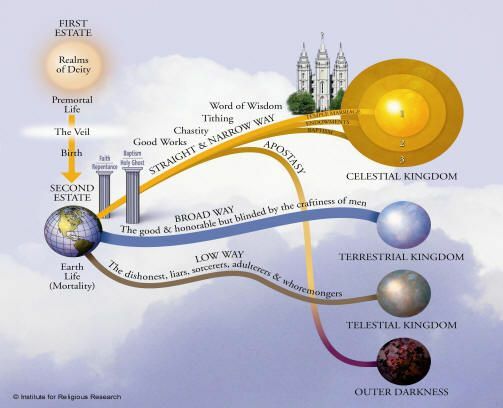 The mental resistance bases itself on an almost unconscious assumption that the Mormon Church teaches the purest doctrines, includes a priesthood authority that God gave it (including a power not unlike Obi Wan Kenobi’s “Force” with which miracles are wrought. Yeah, yeah yeah. Our indignation has taken over our own common sense. We look at years of feeling guilty during the passing of the Sacrament because we were told that the true from of sacrament-participation is to think about the Savior and not so much to relate to remembering the Last Supper and what that might have felt like. We look at years of agonizing over smoking and drinking coffee, having been spiritually inoculated against those things to the degree that we inflict upon ourselves our own sense of less-than in the worthiness sweepstakes because we know there are so many sitting in righteous reverence who are called to serve when we are not. We agonized over tithing and the frequent testimonies that affirmed and/or promised nothing less than the tenets of the prosperity gospel if only we would place the required and requested amount into the outstretched hands of Church authority. We agonized over Church callings as if they were prophetic opportunities to magnify ourselves in our own eyes as much as the eyes of our righteous peers. We in fact came to believe in and live by the most harshest assumption that can be found in any performance-based religion: Only obedience makes one worthy to receive Divine blessings. Which brings us back to the seriously flawed but inspired founder of the great global religion. Joseph the Flawed gifted to his Saints some of the most powerful theological ideas to ever emerge out of the 19th century. This can be done by giving the impression, allowing rumors to spread, and claiming nothing overtly. Just look knowing when funny coincidences happen, and you acquire a reputation for working miracles. Given the reputation, the actual miracles follow, because people believe in you. The most honest confession I can make for myself is that I am a product of what Joseph Smith started two hundred years ago. By the time I was born, the rigid theology, doctrinal principles, procedures and ordinances were in place. But none of those things are currently thriving in my most spiritual of inner sanctuaries. What are however are the habits of search, ponder and pray accompanied by the enculturation of the belief that God hears my prayers, listens to my thoughts and has given to me through my own personal revelatory experience a testimony of his constant presence in my life. With that awareness I occasionally bear testimony of the Mormon Promises and have I have used them to obtain ANY knowledge on ANY subject regardless of whether or not the Church might define my questions as approved and without regard as to whether or not I was ever worthy to just ask the question. That is how I perceived Joseph’s experience with God and the Spirit. His experience left him with the sure knowledge he could -in the eyes of scientific investigation – replicate his experience enough time to give him a confidence that waxed strong regarding revelation and inspiration. An honest consideration of the charlatan reveals how fully confidence waxing strong in spiritual affairs permeates the membership and the overall approach to personal revelation. Which leads me to a few paragraphs appropriate to the title of this article. “I teach them good principles and let them govern themselves.” Joseph Said. So how about let’s govern ourselves and let the dogmatic preaching of a Church with its hand out for cash build its own fortune? I have come to realize that how I see the world spiritually is a direct consequence of the teaching and examples of the charlatan. ​My soul is not some fragile, static and pre-existant jewel given me by God before I left to come to Earth and birth. The soul is alive, responds constantly to every stimulation, forever curious. It had a hand in forming my body and has a hand in maintaining my body and spirit in this life. My soul thrives on subjective experience rather than the mere passage of time in some vague ever-rising eternal progression. My soul has to work with the assets not only given but that which would develop into the mind’s ally most closely involved with physicality: my ego. My ego is not my enemy and cannot pretend to not know what my soul definitely knows. The mind with the ego seated in the captain’s chair constitute the spiritual connection to the soul and eternity in one direction and the world and physical reality in the other. I am then the manifestation of your own soul expressed mortally by the work of the ego. If my ego begins to take itself too seriously, it is up to the soul, who is the only presiding authority in my mortal arrangement, to take the ego to task, restore humility and move forward in faith. In other words, I quote the Gnostic text in which Sophia, the Soul Spirit takes the self-important ego that thinks itself almighty to task. When he said this, he sinned against the entirety. And a voice came forth from above the realm of absolute power, saying, ‘You are mistaken, Samael’ — which is, ‘god of the blind. '” (The Hypostasis of the Archons, p. 167, The Nag Hammadi Library in English, edited James M. Robinson). Without the promptings from the mind of Joseph Smith – who spoke without any correlation of doctrines, performances and belief sets in mind – I would not have come to a place of my own revealed religion and spiritual practice. If religious leadership leaves us confused and perhaps even doubting, I realize how well the process described from the mind of Joseph Smith works for me, and has going back to the commencement of my so-called apostasy. There are no perfect prophets, no perfect general authorities and certainly there is not a perfect church. There is not a perfect culture. I never chose the culture, it chose me when I was born into it. To think otherwise and reject it would be in truth tearing off my own hide. I do not need to do that. Neither do you. Own the way you’ve come to see the world. Own how much of it comes from your culture. Get Them Jehovah! We’re with ya! More excommunications happening this week. When a member feels some sense of risk of excommunication for having acted or even entertained thoughts believed to be offensive to God and the Church, excommunication hangs over the head like an executioner’s sword. What is it we believe we risk when someone else, especially someone else who has an authoritative leadership calling, implies the risk of excommunication? What does excommunication mean and how literally should we take it when another mortal threatens us with being cut off? Read the following form of religious excommunication and ask yourself if the vindictive and mean spirited God of that particular Jewish church is the same God worshipped by another church that wields excommunication like an addiction : the Church of Jesus Christ of Latter Day Saints. Would their God act and think in such a way? cursing him with the excommunication with which Joshua banned Jericho and with the curse which Elisha cursed the boys (who mocked his baldness) and with all the castigations which are written in the Book of the Law. cursed be he when he lies down and cursed be he when he rises up. Cursed be he when he goes out and cursed be he when he comes in. and all the curses that are written in this book shall lie upon him, and the Lord shall blot out his name from under heaven. And the Lord shall separate him unto evil out of all the tribes of Israel, according to all the curses of the covenant that are written in this book of the law. Nope! Not with the least degree of allowance! Removing the guilt is an okay concept I suppose so long as one buys into the idea that sin summons guilt in the same way that a crime involves guiltiness. In my reality and opinion I do not see God as in the crime-and-punishment business whether due to laws and procedures created by God or due to some nebulous notion of “justice” which demands a karma-like accounting of credits and debits. For most within the sphere of Mormonism a thought involving excommunication is usually a thought involving the idea of having offended God or some rule of God that demands recompense. The idea of a Church benevolently (by removing something called guilt) terminating membership and by extension the hope of eternal life is nothing more than a theological notion that has gained traction by tradition. It is in effect a disingenuous reasoning to justify a procedure intended most fully to assert authority and encourage conformity. The bulk of Christian belief is based on theology. Theology, by the way, has always been and always will be human religious speculation, suspended disbelief and an imputation of human attitudes in the Divine Mind. Seems that the best idea is to remove the notion that excommunication is a valid and needful piece of gospel repertoire. In doing what might also be discouraged is the excessive sober judgmental seriousness – the taking of one’s authoritative calling as a mandate to do whatever is necessary to defend God and The Kingdom. Something else might be dissuaded, the temptation to use fear, shame and guilt as motivation toward desperate conformity. which by the way is the single needful question a genuinely true and living church should ask members in a temple recommend interview. Bring your excommunicants back into the fold with open arms and no conditions. Make a truly grown up and loving expression of acceptance of the many forms of spiritual and religious devotion manifested by all genuine and believing Saints. You will be more grandly and publicly accepted as a worthy institution. Time … long overdue in fact … that we leaped down off our crosses. On mark-missing and being mistaken in what we say and do. It is interesting how many of our human foibles – particularly when they are our own – tend to be more effectively dealt with as if we are correcting a missing of the mark. Most Christians however are not taught that their mistakes are missing marks. Rather, sins are SINS; behavior that offends, disappoints or hurts God’s feelings. These notions are reflected in how we are exhorted to face up to our sins and sinfulness; to feel the cultural guilt, shame and sense of having offended a God who cannot tolerate sin with any degree of allowance. Congregations are full of mark-missers, not sinners. Many have missed the mark big time. In the opinions of those who seem to specialize in detecting mark-missers and seek out indications of sin, mark-missers shoul be called to repentance. Why? Because by theological notion they have offended a thin-skinned God who cannot tolerate you-know-what with any you-also-know-what. Trouble is that it’s hard to love with all one’s heart a low-tolerance-with-no-allowances kind of God. A God who cannot tolerate mark-missing to any degree is a God to be feared, not respected. We know we are not expected to be perfectionists in this life. We know that perfectionists not only die young with high blood pressure, but also they have unreasonable expectations and make unreasonable demands on those around them. Perfectionists tend to be highly intolerant of “flaw-ful-ness” and imperfection in others. Likewise, most perfectionists imagine themselves to be subject to the terror of not being tolerated with much degree of allowance by those upline in a hierarchy whom perfectionists view as powers that be. Why would we need to believe in a Supremely Divine Perfectionist who has labeled His own children as inherently sinful; as too tragically flawed to turn out perfect? … and who stubbornly and relentlessly insists that He (The Supreme Divine) is is unable to tolerate you-know-the-rest? Sin has been incorrectly defined and then institutionalized for the most part as a wicked act, something that is in a nasty way an affront to God. Acceptance of the notion of sin suggests that the God of no- compassion is obsessed with morality as the basic concept by which Goodness is defined. The implication suggests that therefore we mere mortals should also obsess on sin. So many among us accept the changed meaning and image of sin as something immoral which is then married to the image of a judgmental and punitive God. It then follows that sin creates in our lives a sense of something connected with the more powerful word, “evil”. It then becomes easy to accept the idea that the Divine Monarch Himself is offended – precisely because when we sin; because we commit evil acts. One might conclude that when the phrase “we are all sinners” is expressed, the horrific “we are all evil” is just around the bend. Sinfulness viewed in that manner then literally relegates humanity to living in a state of criminal activity as viewed by God. That seems to be the desired state needful to those who equate morality to theology; whose pastoral livings are based on teaching about the evil of sin and offering advice on how to clean it up. Once we can conceive of God being offended, we cause God to no longer be God. God should be much larger then merely being “offended.” An offended God has been reduced to a reflection if judgmental mortals ; as such is no longer really God or God-like. It gives lie to any pronouncement of mercy. Jesus understood this and used the Prodigal Son to demonstrate it. From the labels of sin and evil, the next logical step with sin is a concept of punishment, exclusion or discriminatory thinking in which the sinner somehow has failed while the rest are still acceptable to God. The sinner now has a handicap that leaves him/her “less-than” until the other FORM-ula (as in form over substance) ingredient of repentance is accomplished. Exclusionary thinking awakens discrimination at this point. Many believers almost unconsciously decide that since the sinner is now “less-than” what true believers consider themselves to be, many believers suddenly find themselves “uncomfortable” in the presence of sin and/or sinners. Believers and non-believers tend to exclude by condemnation, by social avoidance, by shunning, by excommunication or by something worse. All of which is a false and non-scriptural path and reflects the spiritually violent thinking of the Prodigal Son’s older brother. The arrogance of that act is reflected in Roman Catholic calls to Crusades and more horribly in the Inquisition. When we casually equate the word “sin” with “evil” we are never very far from looking like and participating in the evil acts of those Inquisition accusers who self-righteously assumed that they had a God-approved right to judge and punish. Reformers such as Luther only put a Protestant spin on the traditional concepts of sin which came out of Roman Catholic dogma – concepts that remain reflected and camouflaged within the Bible today. Protestant fundamentalists thrive on the strength of viewing the Bible as inerrant and absolute and portraying the terrible image of a punitive monarchical God. It was not Catholics who executed so-called heretics and witches in New England in the 1600’s. It was Protestants. We members of a Christian society who casually evoke this altered meaning in our use of the word “sin” have habitualized a tendency to judge. We don’t have to be bigots to suffer from the illness of self-righteousness. All we have to be is of a mind that one of our spiritual “shoulds” is to discern not “sin” but whoever has “sinned”. We allow ourselves to condemn the action and feel to thank God that we have not done what the “sinner” has done. However we tend not to stop there. Many of us behave in ways that suggest that we personally feel more holy, more worthy and even more righteous than the sinner. We then deserve the blessings God bestows while sinners do not deserve those blessings. “We don’t hate the sinner. We hate the sin, but we love the sinner.” And many of us lord it over the sinner. There is a smugness and condescension in that statement that is almost impossible to hide. When preached to the choir, such a statement might receive applause. However, as a public declaration of attitude, it is something detrimental to an image of Christian compassion and understanding. It is not the thinking of the Father of the Prodigal Son. It is a thinking that lies at the heart of an attitude which accelerates from hating the sin to advocating punitive action against the sinner. We as a society have systems in place to apply punitive sanctions against those whose behavior crosses the line into criminal activity. Unless we honestly believe that “sin equals crime”, we have no justification for being invested in our morally judgment-and-punish business. It is true that we have every right to make choices around who will be the friends with whom we can safely interact. Common sense dictates that we should do so. But if we truly think we can love the sinner while abhorring the sin, let us put to the test the idea of loving neighbors as we love self –even if we can only do so from afar. If those who preach can get those mortal congregations who judge to stop doing so, they will do a great work in the social context truly honest and compassionate living. It is not God who insists that we label ourselves and convince ourselves that we are sinners, sinful and essentially evil-natured. It is merely other human beings, equally flawed and imperfect as we but who seem to insist that it must be God’s will that we all walk around labeling ourselves as sinners; as sinful and therefore bordering on evil as our natural mortal state. Our own human experience has taught us the value of mental and spiritual reinforcement and its impact on successfully eliciting change that is self-motivated and more likely to come to pass. So does our Divine Mother and Father, who do not consider his creation as something evil. There are many who are quite content to live in the simplest arenas of belief – who feel no need for deeper spiritual and mystical experience and have no hunger to come any closer to God than they are right now. There are others who are so secure and established in a fixed and unchanging spiritual mode that they truly are afraid of really exploring and testing what they really believe. In some cases people like this will be critical of explorers, questioners and testers who are on a quest to come to know God as God knows them – in a highly personal and spiritual context. Traditional formulas full of shoulds and should-nots are like paved roads. There is much to see from the road, but you never know what meadows and mountains exist if you do not step off the road and make your own trail into a wilderness of opportunity. Nowadays the internet is a melting pot of literally hundreds of “post-mormon” or “mormon dissent” or “ex-mormon” websites, blogs and discussion boards. After a while it seems like if you have been to one you have been to all of them. Even the most senior moderators on the most senior discussion boards will tell you that there is hardly anything, any issue, any circumstance or any thought, gripe, rant, disappointment or disillusionment that they haven’t already seen many times over. What’s with the veritable plethora of angry, frustrated, disappointed or disillusioned human beings who do not seem to be able – in a wise, mature or logical way – to write off their connection to the LDS Church and simply get on with life? What then might we do with our Mormon heritage and connections? We are not responsible for the happiness of anyone else in our lives. They are responsible for their own happiness. In that regard, just as we know we have no right or obligation to impose our beliefs on anyone else or make a relationship with anyone else conditional on our being pleased by them, they have no right or obligation in the reverse. We owe our fellow saints our maturity. We have no obligation to reward spiritual and emotional immaturity. If relationships are that fragile and conditional, someone needs to be the adult. It is unreasonable and makes not sense to be in a relationship where one soul is responsible for the contentment of everyone else. If friends and family want a conditional relationship with you … are you not obligated to ask them to grow up? Why must we keep doubts quiet when they arise? One of the admonishments I encountered frequently was that I should refrain from questioning the Church version of the Gospel because by questioning, I might be influencing others of less spiritual strength and causing them to lose their faith. This never made sense to me. The idea that I have power in and of myself to overrule God’s influence in the life of someone else belittles God by suggesting I might overrule God’s will regarding someone else. I came to understand that my own spiritual strength was something I had worked out with fear and trembling assisted by the Spirit. Spiritual strength is not loaned by someone else inside or outside any church. The “true-churchiness” point of view; that way of seeing and believing – trusted as it was for years – broke down. The church never had an adequate response to disillusionment it could not contain by exhortation to conformity, exhortation to more intense and frequent prayer on very limited subjects, and unspoken or blatantly declared accusations of doubt, sinfulness or even apostasy. None of these approaches, used by the Church as tools of control, worked anymore. Over the past twenty five years the Church has lost permanently any control over that contrived narration that encourages blind believing and unjustified fidelity to a cause the Church itself cannot prove exists. The pretended truths constantly crash against the wall of indisputable facts that reveal the pretenses as childish, immature and invalid. There are tens of thousands of LDS Rip Van Winkles who have awakened from twenty or more years of blissful or not-so-blissful) slumber to discover that the reality that secured their lives when they fell asleep no longer exists. Such reality was never real. The theological and religious lullaby that worked so well in the past now comes across to awakened souls as not much more than a medley of childish adolescent ditties. Such is the constancy of that hemorrhage of disillusioned believers that more than likely will continue to grow until the core of remaining church membership will barely facilitate Mormonism’s ongoing decline into the same mediocrity of traditional main-line religions that have little or no influence on the lives of its youngest adult generations. We owe our fellow saints our maturity. We have no obligation to reward spiritual and emotional immaturity. If relationships are that fragile and conditional, someone needs to be the adult. It is unreasonable and makes no sense to be in a relationship where one soul is responsible for the contentment of everyone else. It’s possible to belong and be active … and not have the Celestial Kingdom as your objective. … and have no intention or goal of arriving in the Celestial Kingdom. … pray that God will ask them to grow up? … and leave the mechanics and verbiage of that to God?